ROSEVILLE, Michigan (WABC) -- Did you know you could get fined for heating up your car? One man's parking ticket has gone viral, with thousands of views after he was ticketed for heating up his car in his own driveway. Taylor Trupiano told WXYZ he's still shaking his head over a parking ticket he got on his own property in Michigan. "I thought it was some kind of joke at first, and then I was thrown back by it," he said. "I was really surprised." The ticket was for leaving the keys in the ignition with the motor running and no one around. Trupiano said he was only doing something many people in Michigan do during the winter. "I was in and out in probably about 7-8 minutes," he added. "So in that amount of time he ran up here, gave me a ticket and by the time I got out, he was nowhere to be seen." Frustrated with the ticket, he posted a photo on Facebook where he racked up thousands of comments and shares. 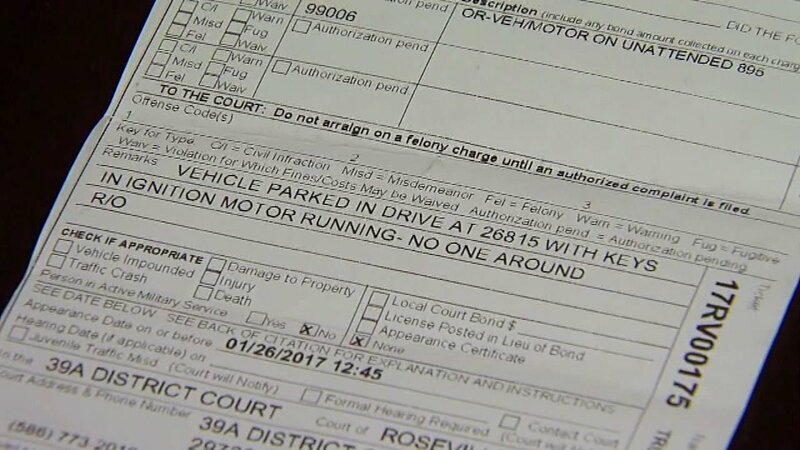 The Roseville Police Department ticket comes with a $128 fine. There is no state law against leaving your car turned on and unattended, but dozens of cities across Michigan have local ordinances. "We have five to 10 cars stolen this way every winter," Roseville Police Chief James Berlin said. "It's dangerous, and of course it drives everyone's insurance rates up. It drives our crime rates up." Many of the ordinances will allow you to use a remote start because the vehicle is locked. Berlin says they will not apologize and in fact, he encourages his officers to enforce this law. "It's common sense. We can't warn everybody of the law there is. Common sense says you don't leave your car running unattended," Berlin said.